Arcus is a high resolution X-ray grating spectrometer mission that was proposed to NASA as a MIDEX in 2016 and selected for a Phase A concept study. The idea for Arcus originated with the proposed International X-ray Observatory (IXO), which would have had a 4 meter diameter mirror and a large suite of instruments, including X-ray imagers and a high-resolution spectrometer. IXO was ranked fourth among large missions in NASA's 2010 Astrophysics Decadal Survey, "New Worlds, New Horizons." This ranking reflected the technical, cost, and programmatic uncertainties associated with it at the time that the assessment was undertaken. However, the science questions that IXO would have addressed were deemed "high-priority", and it was recommended that NASA initiate "an aggressive program to mature the mission and develop the technology" so that the mission could be realized. In response, a team of scientists and engineers continued to work on the grating and optics techonologies necessary to build the high-resolution spectrometer originally envisioned on IXO. In 2014, the spectrograph was named Arcus and proposed to NASA as a SMEX; two years and numerous technological advances later, Arcus was again proposed to NASA in 2016 as a MIDEX and selected for a Phase A study. Arcus will observe astrophysical phenomena over an incredibly broad range, in a sorely underutilized bandpass. Its mission includes investigations from small scales to the largest, including the composition of minute interstellar dust grains, stellar evolution, feedback from supermassive black holes, and structure formation in galaxy clusters. Using technologies developed for ESA's Athena mission and in the world-class laboratories of MIT/Lincoln Labs, Arcus is expected to achieve resolution R (= λ/Δλ) = 3000 over its ~12-50 Å bandpass, an improvement of an order of magnitude over existing or approved observatories, such as Chandra, XMM-Newton, XARM, and Athena. Its key characteristics are summarized in Table 1. No other mission, current or planned, offers these capabilities. The effective area and figure of merit [sqrt(effective area * spectral resolution)] are shown in Figure 1. A comparison of example spectra from Arcus and other X-ray gratings are shown in Figure 2. After a short calibration period after launch in 2023, it will operate as a general observatory to which all members of the scientific community are strongly encouraged to apply. 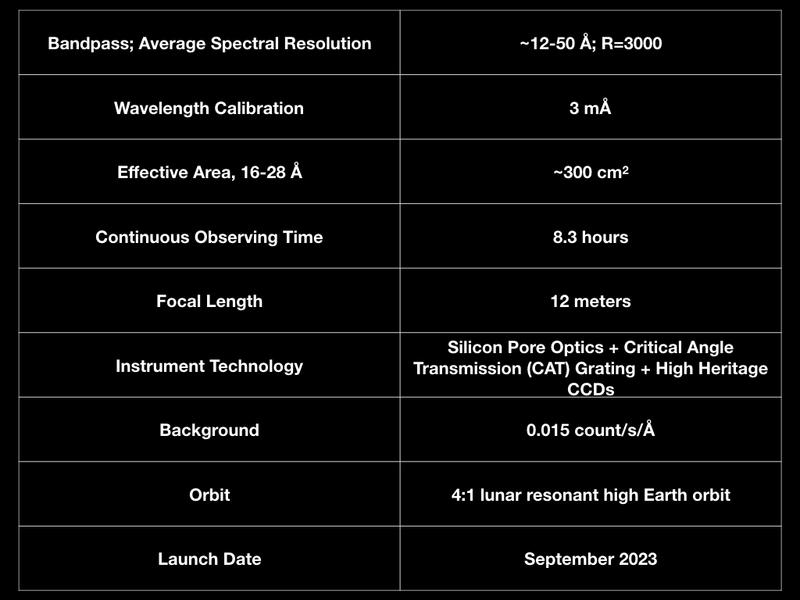 Table 1: The Arcus key characteristics. Figure 1. Left: The Arcus effective area. For comparison, the maximum effective areas over this wavelength range of the Chandra gratings and XMM-Newton/RGS1+RGS2 are ~10 cm2 and ~100 cm2 , respectively. Right: A comparison of the line detection figure of merit for Arcus and the gratings on the XMM-Newton and Chandra telescopes. The wavelength ranges where lines from ionized oxygen and carbon, a critical part of Arcus's science, are indicated. In those regions, the solid horizontal lines indicate the sensitivity needed for the baseline mission; the dashed lines denote the same for the threshold mission. Figure 2. Left: A section of the spectrum of X Persei as seen with Arcus and several current and planned observatories. Right: The spectral features from ionized and neutral oxygen gas and three different types of dust are clearly detected. Only Arcus will have the sensitivity needed to resolve these features.